It has joined a group of once-profitable industry leaders that can now be classified as penny stocks. Some companies, like General Motors Co. (NYSE: GM), are able to rebound from penny stock levels. As the U.S. car market continued to falter, GM eventually entered bankruptcy in June 2009. Existing shareholders were given shares of Motors Liquidation Co., which traded for pennies (much to their dismay). Thanks to a government bailout, GM stock reemerged in November 2010, near $34 per share. Today, shares trade near $37 and the stock has gained 17% in the last year. Eastman Kodak Co. is a prime example. Founded in 1888, Kodak dominated the photographic film market for much of the 20th century. In 1976 the company had a 90% market share, and in 1987 the stock was worth more than $100 per share. But the company could not keep up with the advances to digital photography, which made classic film nearly obsolete. In 1997, Kodak started its slow decline. By 2011, shares were worth just $0.54. 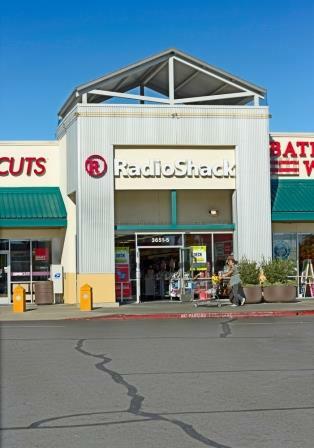 And while RadioShack is the most recent example of a high-flying stock that dropped to penny stock levels, there are plenty of other major companies that are prime candidates to make the same move. Penny Stock Territory: J.C. Penney Co. Inc. (NYSE: JCP) is already dangerously close to penny stock territory as it currently trades at $8.72. In fact, JCP actually fell below the $5 threshold in February before regaining some slight momentum. Even though JCP stock is up 3% in the last three months, its financials are still worrying. In its last earnings report, JCP reported a loss of $0.68 per share. At the time, that was viewed as a major boost for the company since consensus estimates placed JCP earnings at an $0.85 loss. Recently, the fact that JCP hasn't been doing as terribly as thought has boosted the stock. But that shouldn't bring investor confidence. In 2007, JCP stock was worth more than $85 per share. Today, JCP is teetering on the brink of being a penny stock. "This is an iconic brand, but I think it's dead on arrival" Money Morning's Chief Investment Strategist Keith Fitz-Gerald said in early 2014. "I don't think this stock is trading in five years." Penny Stock Territory: BlackBerry Ltd. (Nasdaq: BBRY), formerly known as Research in Motion, is the company behind the once-popular BlackBerry smartphone. During its heyday of 2007, BBRY stock was worth more than $230 per share. Now, BBRY trades just above $10 per share. BlackBerry has been muscled out of the smartphone market by competitors Apple Inc. (Nasdaq: AAPL) and Samsung, whose iPhones and Galaxy S smartphones have become the toast of the smartphone market. The only hope for BBRY stock seems to be the numerous patents the company holds, which could make it a buyout target at some point down the road. While that sliver of hope remains, BBRY's financials are a disaster. It has reported losses in seven of the last nine quarters. Its profit margin was -122% last quarter, and its operating margin was -73%. Quarterly revenue growth was -68% last quarter. BBRY is up from a 52-week low of $5.44, but it may be only a matter of time before this once-giant tech company is a penny stock.